These beautiful mother & babies in a pod, were inspired by the sweetness of motherhood. They are one of a kind limited edition wearable art pieces. We have the 3 in the pictures in stock. Please indicate which one you would like. They could be made to order, and personalized. Please specify hair & skin color, how many babies and color of pod (white, green, pink, orange, yellow) The colors will be antiqued, to achieve the mother-earth look. 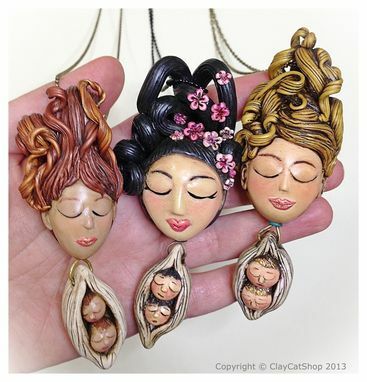 Custom made Mother & Baby pendants have a cost of $120. Please allow 8 business days to design and hand sculpt your custom order. This is a limited edition, ClayCatShop's original design for 2013. Please allow 10 business days from the time of the ordering for its creation and shipment. Please be aware that since we dont use any molds in our creations, there might be slight differences from the one in the picture which makes your locket one of a kind and a truly wonderful art piece.